In just 10 days, on 10th February, 2019, the world will see the grand opening of the wondrous Kirti Mandir BROADCAST LIVE on Jagadguru Kripalu Parishat channel on YouTube . Kirti Mandir, is the first temple of its kind in the whole world, showcasing a very special sculpture that has never been seen anywhere else, in any temple. The sister temple of the breath-taking, gorgeous Prem Mandir in Vrindavan and the charming Bhakti Mandir, this temple is sure to turn heads as it stands on a vast land of untouched India in Barsana. Dancers and bands from many parts of India will be represented during the grand opening ceremony where thousands of people from all over India and the World are expected to attend. Special 'Ras-Leelas' will also be performing LIVE, showcasing Hindu and Indian culture in a unique manner. Almost every traditional musical instrument of India will be played during the event. Officiating at the event are the Presidents, Dr. Vishakha Tripathi Ji, Dr. Shyama Tripathi Ji and Dr. Krishna Tripathi Ji, of Jagadguru Kripalu Parishat, a charitable and spiritual organization that has helped over 4.2 million impoverished lives through its hospitals, poor-relief fund and all-girls school in Kunda. 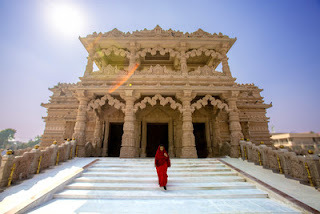 In honour of the opening of this grand Temple, the organization has pledged to help 50,000 impoverished individuals and have so far reached 45,000 of them. A further 15,000 underprivileged individuals will be given important necessities on 11th February, 2019, the day of the Public Opening of this temple, going beyond the pledged number and reaching many more lives. Watch a special video in the documentary, 'The Plight of the Widows of Vrindavan'. The full schedule of the LIVE BROADCAST .